Goodbye July, Hello August. | The girl who loved to write about life. 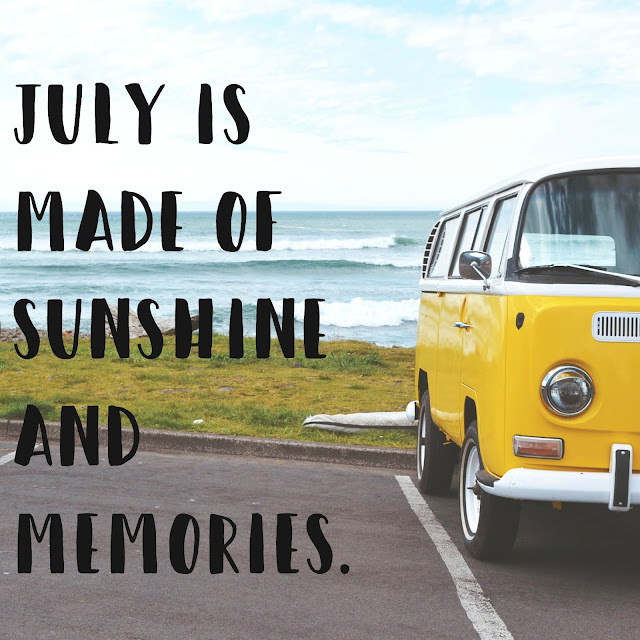 The magical summer month known as July has come to a close, and when the sun comes up on Monday, it will be bringing August with it! August is such a fun month because at the begining of it, I am 100 percent SUNSHINE AND SUMMERTIME TEAM SUMMER FOREVER, and by the end of it, I am FALL FALL FALL IT'S COMING YES FALL. Luckily, life in Florida is special and there will be pool days (probably) well into October, so summer never really ends. But there's just something about the end of August that has me drinking pumpkin coffee and perusing pumpkins at Hobby Lobby. I have a problem. I know. But for now, I'll continue on in full-blown summer mode. Popsicles and pooltime and sunshine until late at night. I'm not saying goodbye and hello to a lot of things this month, and that makes me really happy! Because it means that I'm moving into a more settled season of life. After years of planning and looking ahead and weighing different decisions and counting down, I cannot tell you how good it feels to just be here. So goodbye, July. Goodbye to a month that tested me and pushed me, that made me fall in love with my life, and that showed me I'm way stronger than I think. And hello, August. Hello to a month of soaking up the sunshine at the pool with my little family whenever possible. To checking out way too many books from the library and to setting new goals. To lots of snuggles from my chubby little guy and to continuing to push myself and make a life here. Hello to making a thousand and ten memories. I have a feeling it's going to be a really good month.